The week of action against poverty pimps Atos Origin begins this Monday 9th May with a picnic and party in Triton Square, Euston, home of their head office, at 2pm. blog, post on facebook and forums, tweet and email all who may be interested. Origin know exactly how we feel by contacting them, complaining and exposing their grubby money making scheme which has already led to suicides. For full details, plus links to Atos blogs, facebook pages etc visit the website above. faceless corporate wasteland that is home to poverty pimps Atos Origin Ltd.
supporters welcome. Please help spread the word, invite your friends and let’s make this the biggest stand against poverty pimps Atos Origin so far. Guardian journalist John Domokos will be there, he wants to investigate how ATOS tests are being carried out. He is also very keen to attend a WCA test, and a tribunal, and try and record them so would like to meet some people who have been through it all ready. 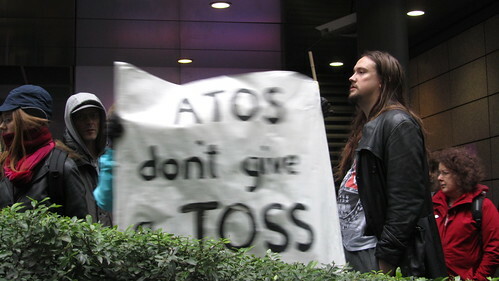 another demonstration between 3.30-5.30 Thursday 12th May 2011 outside ATOS, Flowers Hill, Brislington. Disability Benefits Building at St. Agnes road, Gabalfa, Cardiff. faceless corporate wasteland that is the Benefits Building! their offices in Liverpool the same day. House , Marsh Mills , medical centre in Plymouth from 10.00 am Monday 9th May. In York, we will be leafletting from 8am-9am, meeting outside Banana Warehouse on Piccadilly (round the corner from the Atos offices), followed by a photo op with the Press. Anyone interested please come along, and if you’d like to get involved with the group please contact us at yorkwelfarecampaign@gmail.com. Our next meeting is Tuesday 17th May, meeting at 7:30pm at the Black Swan on Peasholme Green. Remember, if you’re going to use the ATOS Origin line to let them know your feelings, to use 141 (or whichever prefix withholds your caller ID) before you dial the number. It doesn’t do to give them a handy means of identification. Birmingham against the cuts today in support of EHRC Debbie Jolly: The Billion Pound Welfare Reform Fraud: fit for work?